Not surprisingly, the most massive birds can't fly. The ostrich is a familar example of the typical shape of the heaviest birds. Not an ostrich. Artist's conception of Vorombe titan. In the 19th century zoologists became aware of fossils of an extinct family of large birds in Madagascar. These giants became known as “elephant birds.” Apparently a number of species had existed, of differing sizes, though all large. The biggest species was dubbed Aepyornia titan (sometimes called Aepyornia maximus). Given enough A. titan bones, the zoologists could picture the entire skeleton, and estimated the bird stood 10 feet tall. Its main leg bones, the femurs, were astonishingly thick. The eggs were impressive too, especially the very rare intact fossils. (And still are. In 2013 Christies sold one in London for $101,813). 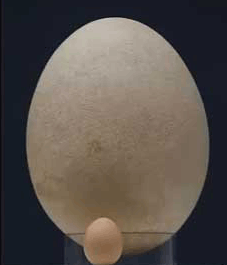 The bird laid 9-liter (2.4 U.S. gallons), 20-pound eggs a foot long. The yolks of these eggs are the largest known cells. One egg could make scrambled eggs for a very large village, and probably did. Although some elephant birds survived as late as the 17th century, the giant species of Madagascar (not only elephant birds, but also giant lemurs, hippopotami, giant tortoises) are now all extinct. It has usually been thought that their extinction began when humans arrived on the island about 2500 years ago. However, recently scientists have found human-made tool marks on 10,500-year-old elephant bird bones¹, a discovery that not only pushes back by thousands of years the date when humans first arrived in Madagascar, but shows that people and these animals coexisted for thousands of years. All body mass estimates for giant extinct birds should be interpreted with caution as they fall outside the range of extant birds used in model construction; however, our newly derived mass estimates for elephant birds based on least femoral shaft circumference measurements (table 3) demonstrate that the mass of Vorombe (mean = 642.9 kg, range = 536–732 kg) exceeds estimates based on comparable data for other extinct Quaternary giant birds such as Dinornis (Dinornithiformes: range = 61–275 kg) and Dromornis (Gastornithiformes: male mean = 583.6 kg, range = 439.3–727.8 kg; female mean = 440.7 kg, range = 316.6–560.0 kg) [58,59], giving it the largest estimated body mass of any bird on record. Indeed, the largest elephant bird femur measured for this study (MNHN MAD 368) was incomplete and therefore could not formally be assigned to a cluster due to our conservative analytical framework, but must also be referable to Vorombe on the basis of size; this specimen had a least-shaft circumference of 308 mm and a corresponding mass estimate of 860 kg, making this the largest known bird individual ever recorded. James P. Hansford and Samuel T. Turvey. Unexpected diversity within the extinct elephant birds (Aves: Aepyornithidae) and a new identity for the world’s largest bird. Royal Society Open Science, 26 September 2018. Dinornis maximus, a remote relative of Dromornis that lived in New Zealand, becoming extinct around 1800. It was the tallest bird that ever existed, at around 11 feet 6 inches. The bird the present author would least like to meet in a dark alley is Phorusrhacus inflatus, which lived in Patagonia from the Early to Middle Miocene. Ten feet tall with a heavy, flesh-tearing beak like that of an eagle, this fellow was definitely a meat-eater. 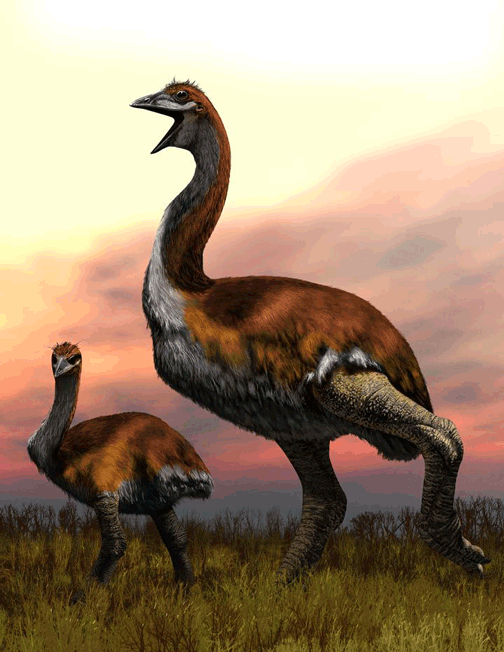 In the Early Eocene New Jersey had some big birds; Diatryma gigantea stood 7 feet tall. (Its fossils are also found in New Mexico, Wyoming, and parts of Europe.) We don't know what it ate. The ostrich is the heaviest and tallest of living birds, with adults reaching 156 kilograms (345 pounds) and 2.7 meters (9 feet). The ostrich is the fastest thing on two feet. The heaviest modern bird that can fly is the Great Bustard (Otis tarda) or similar-sized Kori Bustard (Ardeotis kori), which weigh up to 21 kilograms. Another contender is the mute swan (Cygnus olor); adult males weigh about 20 kilograms. 1. James Hansford, Patricia C. Wright, Armand Rasoamiaramanana, Ventura R. Pérez, Laurie R. Godfrey, David Errickson, Tim Thompson and Samuel T. Turvey. Early Holocene human presence in Madagascar evidenced by exploitation of avian megafauna. Science Advances, 12 September 2018, vol. 4, no. 9, eaat6925. The Dromornithidae, an extinct family of large ground birds endemic to Australia. Bulletin of the Bureau of Mineral Resources, Geology and Geophysics, number 184, pages 1-190. Canberra: Australian Government Publishing, 1979. Among all living birds there is a strong correlation between the sizes of a bird's leg bones and its mass. where M is body mass in grams, CF is the least diameter of the femur in millimeters, and CT is the least diameter of the tibiotarsus in millimeters.² No such relationships have been found for wing bones; there are too many different ways of flying. The leg bone/weight relationship has been used to estimate the weights of fossil birds. 2. Kenneth E. Campbell, Jr. and Eduardo P. Tonni. Size and Locomotion in Teratorns (Aves: Teratornithidae). The Auk, vol. 100, pages 390-403 (April 1983). Page 392. The authors credit John Anderson for first calling attention to this correlation. Kenneth E. Campbell, Jr., and L. Marcus. The relationship of hindlimb bone dimensions to body weight in birds. 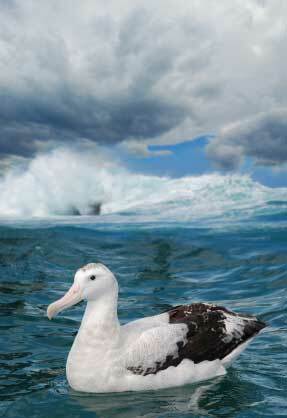 Among living birds, the wandering albatross (Diomedea exulans) has the greatest wingspan, about 3.63 meters (about 12 feet). 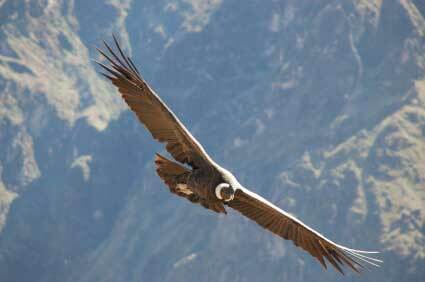 The Andean condor (Vultur gryphus), a living species, has a wingspan of 3.2 meters (10.5 feet), as does the marabou stork. The fossil bird with the largest known wingspan (as of 2010) is Pelagornis chilensis, a seabird that lived in Chile 5 to 10 million years ago. Its wing bones, which have been recovered, are the longest of any known bird. From them, the wingspan has been estimated as at least 5.25 meters (17 feet). A close second is Odontopteryx gigas, another seabird, with an estimated wingspan of about 4 m.
A vulture-like South American bird of the Late Miocene (about 6 million years ago), Argentavis magnificens, is estimated to have had a 7-meter (23-foot) wingspread and to have weighed an estimated 70 kilograms.² The wing bones of Argentavis, however, are shorter than those of P. chilensis. Computer modeling² using these estimates suggested that the bird didn't have enough muscle for flapping flight, but could soar on thermals. Taking off and landing would have been a problem; probably it required a head wind and/or a slope for running downhill. 1. Gerald Mayr and David Rubilar-Rogers. Osteology of a new giant bony-toothed bird from the Miocene of Chile, with a revision of the taxonomy of Neogene Pelagornithidae. Journal of Vertebrate Paleontology, vol. 30, no. 5, pages 1313-1330 (2010). See page 1327 for a comparision with Argentavis magnificens. 2. K. E. Campbell, Jr. and E. P. Tonni. A new genus of teratorn from the Huayquerian of Argentina (Aves: Teratornithidae). Natural History Museum of Los Angeles County, Contributions to Science, vol. 330 pages 59-68 (1980). K. E. Campbell, Jr. and E. P. Tonni. The Auk, vol. 100, pages 390-403 (1983). 3. Sankar Chatterjee, R. Jack Templin, and Kenneth E. Campbell, Jr. The aerodynamics of Argentavis, the world's largest flying bird from the Miocene of Argentina. Proceedings of the National Academy of Sciences, vol 104: pages 12398-12403 (2007). The smallest bird is found in Cuba: the bee hummingbird, Mellisuga helenae (Lembeye, 1850). Two inches long, it weighs less than 2 grams and its eggs are only 0.3 inches long. More than 30,000 Mellisuga helenae eggs would fit in a single Vorombe titan egg. Last revised: 4 October 2018.